Today - I wanted to share with you a card I am submitting for the latest Virgina's View Challenge. It caught my eye with the inspirational photo with all the color!! You all know I love color! It makes me happy! 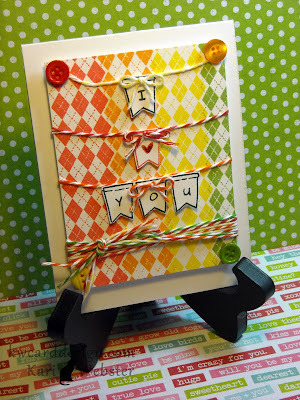 I used my new stamp set from Paper Smooches called Debonair. I love all three of these images - but the diamond pattern is my favorite. I just imaged this stamped several times in a border filled with color. I, then stamped the banner image from Lawn Fawn's Bannerific. Then I took the I love you sentiment from Say Cheese, and broke up the sentiment to fit the banner. Since the photo had buttons, I added buttons to the corners to coordinate with my ink colors ( all from Memento ink), and the same with the Bakers Twine from The Twinery. I am also literally submitting this into the Paper Crafts Magazine Stamping Royalty Contest. It is one of 4 cards I am submitting. Ever since I found out about this contest 2 years ago - I've wanted to enter. As nervous as I am, I wanted to give it a shot. You never know until you try! Hope that your weekend is fantastic where ever you are in the world!! Make it great!! Love this happy and cheery card, Kari! I love the banner idea and colorful background! Thanks SO much for joining the fun with us at Lily Pad! Kari, I really like how you took on Virginia's challenge! Love these happy colors! 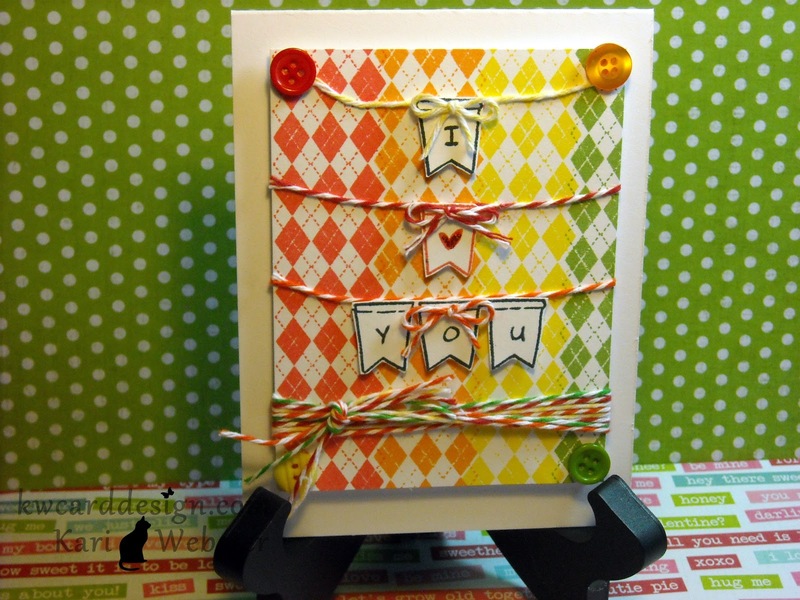 So glad you played with us at Lily Pad Cards!